Back in the ice cream business! The ‘Ice Cream’ (a.k.a. ‘Java Blue’) banana clump is very much back in business, after having been devastated by the freeze almost 11 months ago. Look closely and you can see at least four sets of fruit and their blossoms. 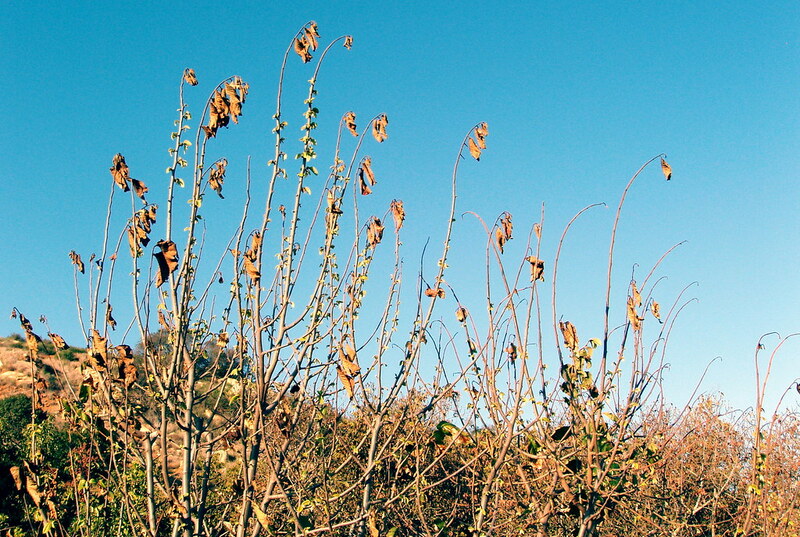 Each of these fruit-bearing stalks bloomed after the freeze, and while some of the bigger stalks lived through the freeze, there was no green foliage on this clump for a while after that setback. A good long and warm summer sure has made a difference. And this is one of the very best bananas. If only we can avoid another cold spell, we are going to have a lot of fruit in the next month or two. The photo below shows what this clump looked like on 16 January, the day after the first of five nights of freezing temperatures. (It looked a lot worse a week later.) The ‘Ice Cream’ is the clump to the left. On the right is the ‘Goldfinger,’ off which I just harvested the first post-freeze fruit Monday. Just in from of the ‘Ice Cream’ clump in this photo is the ‘Bombay’ mango, which looks sort of OK here, but did not make it. 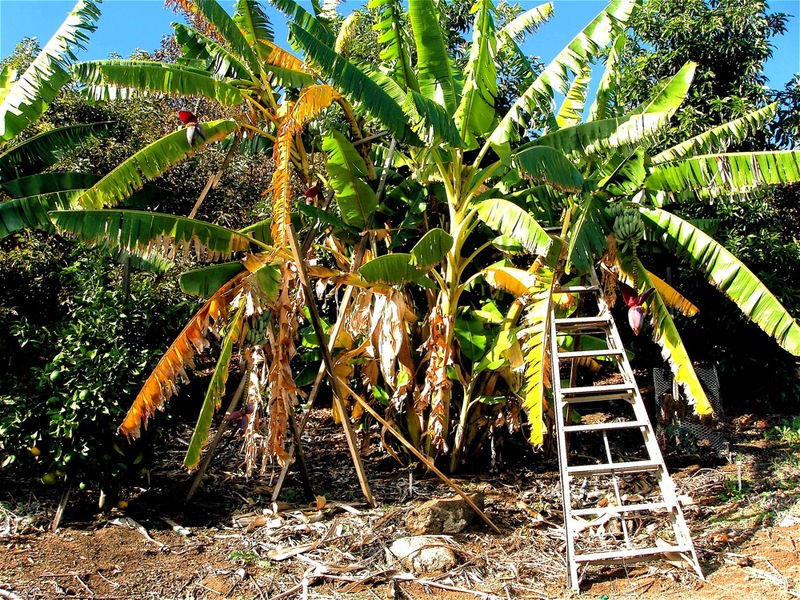 Looking back at the first photo above, that empty circle of chicken wire in the shadows to the right of the banana clump is where the mango used to stand. Only a shoot off the rootstock (the aptly named ‘Turpentine’) now grows where the tree formerly stood. On the other hand, compare the avocado trees in the two photos. Now you would hardly know they ever had been harmed. I had given up on this lychee tree long ago. I was just too lazy to remove it after its apparent death from the freeze of mid-January. Miraculously, six months later, the roots began to send up sprouts again! Fortunately, this lychee was propagated as an air layer, meaning that it is growing on its own roots. If it were grafted, the new sprouts would be from a rootstock of some variety that was undesirable for its fruit and the desirable fruiting variety grafted to the rootstock would be a goner. 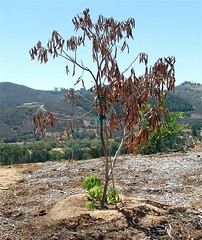 There is also a mango tree on the finca that was killed to the ground, but began to re-sprout earlier in July. However, it is a grafted tree, so the variety that is now sprouting is the all too aptly named ‘Turpentine.’ I might be able to graft a good variety on to it next year, however. 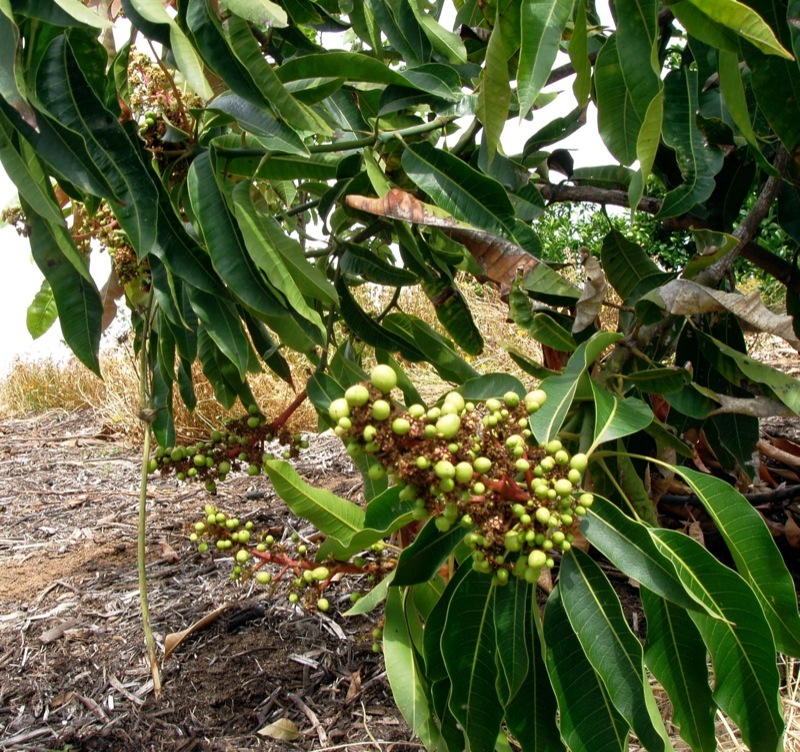 As for the lychee, the killed parts represented years of growth. So we still have a very big setback from the freeze. But the will to live is stronger than the freeze. This is the view now looking west from Ladera Frutal HQ. 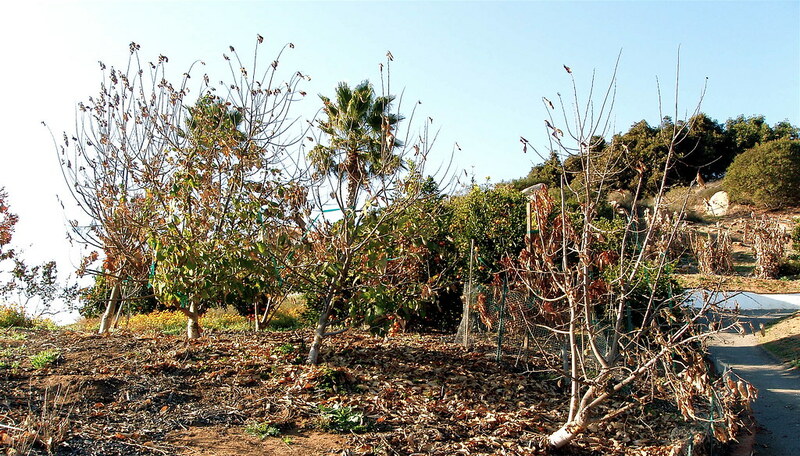 An avocado grove has been stumped and the trunks whitewashed. This is now a common sight in these parts, as trees that had their tops severely killed back in the freeze in January are being prepared for re-grafting on to the still-alive tissues of the trunks. * The whitewashing protects the trunks from sunburn; like many broadleafed evergreens, avocados have thin bark. Deciduous trees tend to have tough bark, because they spend a significant part of their lives without foliar canopy. Obviously, for an evergreen, a lack of canopy is an anomaly. 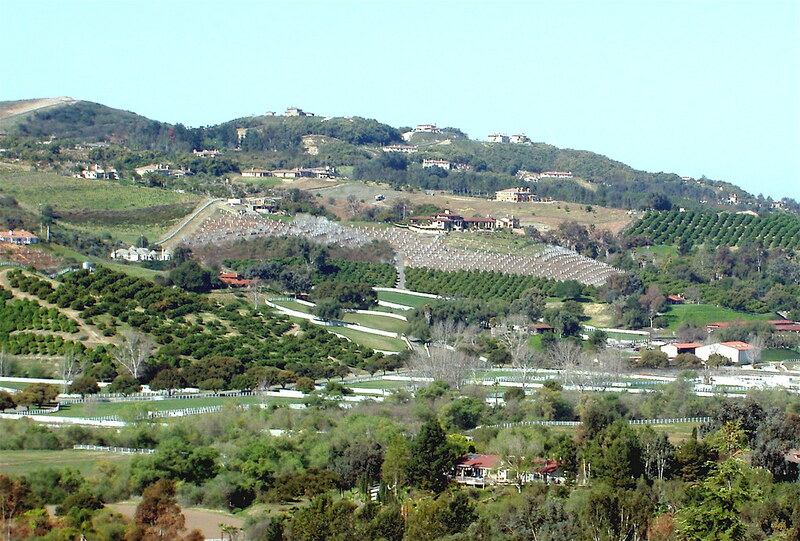 In the photo, at elevations just below the whitewashed trunks, one can see citrus trees (grapefruit, mostly) which have no damage from the freeze. (The entire canyon is now scented with their blooms!) And on the distant hilltops, the dark green represents avocado trees flourishing where they were planted high above the freeze line. The following view is to the southeast, also from LF HQ, looking across the canyon. It shows quite starkly how freeze damage is a threshold phenomenon. 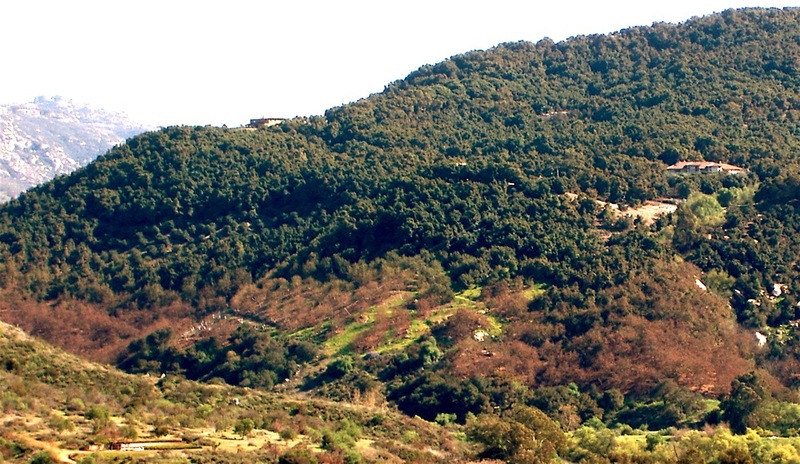 There is no gradation in the visible damage as one goes up the slope. Rather, there is a line–the precise elevation of which differs with the contours of the hills and their sun exposure and air drainage. Below the line, devastation. Above it, healthy trees. The damaged parts of this grove likewise have now been stumped and whitewashed. * Or, probably, simply letting them re-sprout, given that they probably have live tissues above the original Hass graft. Having been hit hard by the freeze in mid-January, the cherimoya trees are now budding again. This one shown here is the ‘Helmuts,’ probably the second hardest hit of our orchard’s block of cherimoyas. The tops of the branches are killed back (i.e. the extremities suffered most from the cold), but the remainder of most branches is alive and now sprouting the growth of spring. Note the brown leaves clinging to some parts of the branches. Dead leaves cling to dead wood. Living tissue pushes its dead foliage off, and so now I realize that the massive leaf fall shortly after the freeze was a good sign. At the time, it sure did not seem that way! 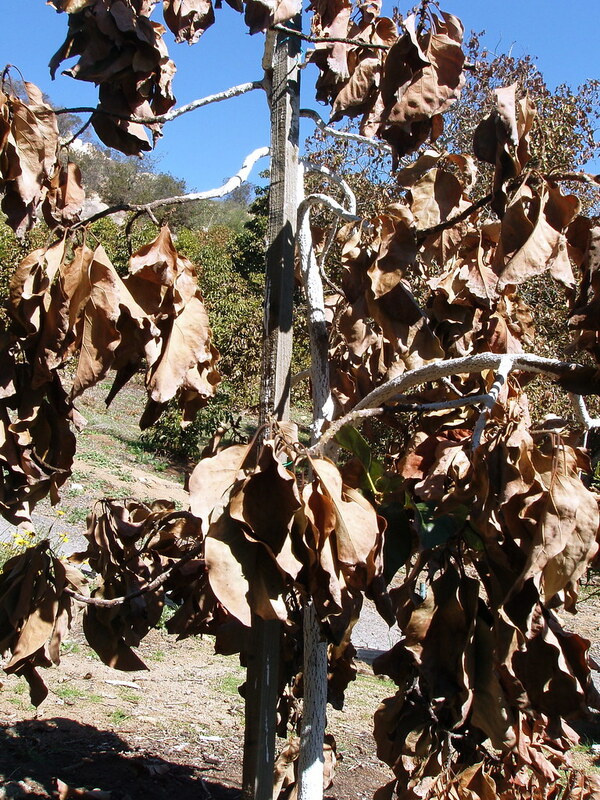 Normally in this region, cherimoyas defoliate for a very brief period in April, thus making the cherimoya, at least in our climate, a rare case of a deciduous subtropical, albeit one that drops leaves only after the real deciduous trees have leafed out following their months of winter dormancy. These trees have now been mostly without leaves for over two months, and I had feared that they would be far off their normal cycle if they re-leafed too soon after the freeze. But now they are only a bit early, and I suspect they will get back to normal fairly soon, despite the shock. In fact, they might even bloom especially well this year, there being nothing like instilling the fear of death in a fruit tree to get it “thinking” about reproducing! Whether they can hold and ripen fruit their first year after such a big setback to their internal energy levels is another matter. The mature trees on the ridge are really badly damaged. This hillside is right where two canyons converge, so it certainly would have been hit by a lot of cold air during the freeze in mid-January. Below the mature trees some saplings had just been planted last summer. In the larger versions of this photo, the white stakes that supported these little trees remain visible. The saplings were probably killed. 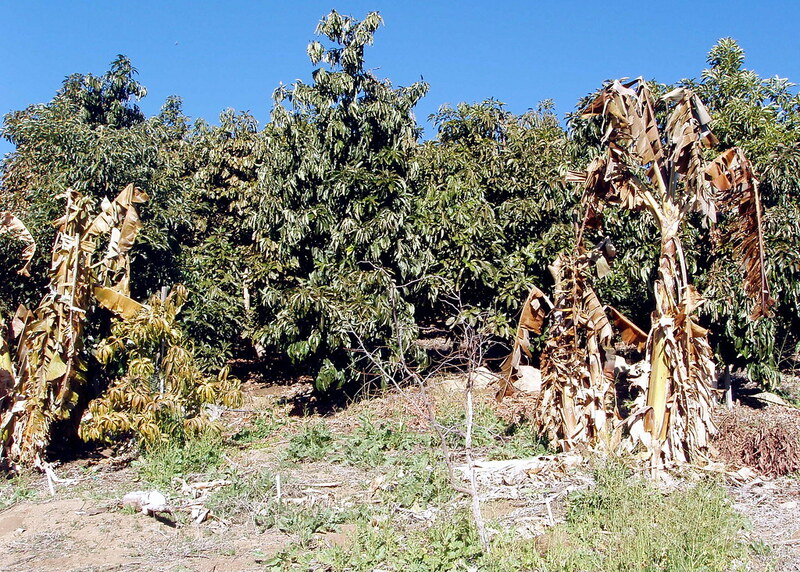 This grower took quite a gamble in planting Hass avocados so close to the canyon floor. 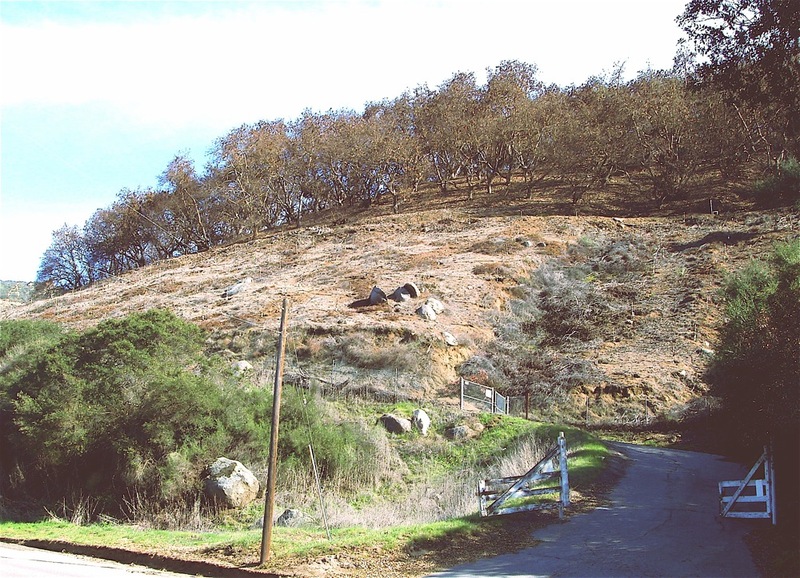 That’s Moosa Canyon Road visible at the bottom left of the photo (I am standing across the main road from where this grower’s access road heads up the hill.) Here the road is barely above the creek, so this is about as low as the canyon gets. I’d guess the temperature dipped close to 20 at creek level, and was probably below freezing even up where the mature trees are for close to eight hours one night and five or more the next. A gamble lost. * We are on the south-facing slope, and this grove is visible from here, a bit to the east. This was how the ‘Thomson’ mango looked last May, as it was setting its first crop, and a heavy one at that. And were these mangoes ever delicious! As can be seen to the right of the above photo, the mandarins are fine, and they are loaded with fruit. 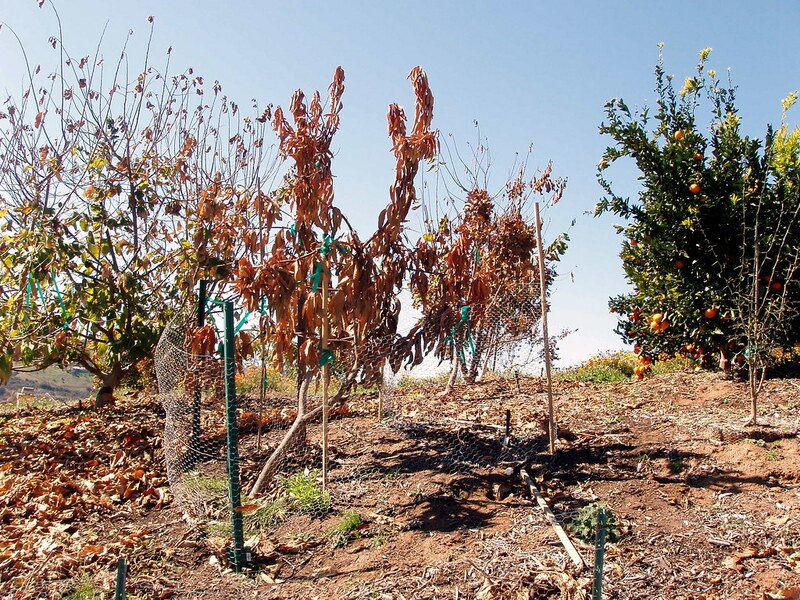 In fact, all the citrus seems fine, other than a few very young trees. The foliar damage is not trivial on some of the trees in the grapefruit grove down the slope, but the fruit appears to be of fine quality. The two sapodilla trees (one of which was depicted just over a year ago, the day it blew over and had to be re-staked) are dead. The more distant tree in this photo has a distinct rust color at the base of the trunk–the color of death. These trees, which produce a luscious fruit I have heard described as “pears with brown sugar,” had just set blossoms and, for the first time, were developing some fruit (from a previous bloom) that might have ripened this summer. In the photo above, some of the freeze-dried blossoms can be seen. And in the branch in front, you can see where I scored the bark to see if it was green underneath. Nope. All brown, and so is the trunk. A ‘Nabal’ avocado that was just finally looking healthy and mature enough that it might have borne this year is not dead (believe it or not! ), but it is severely damaged. The cherimoyas probably all survived, but they look worse and worse with each passing week. They will take some time to recover. This year they had their first significant crops. 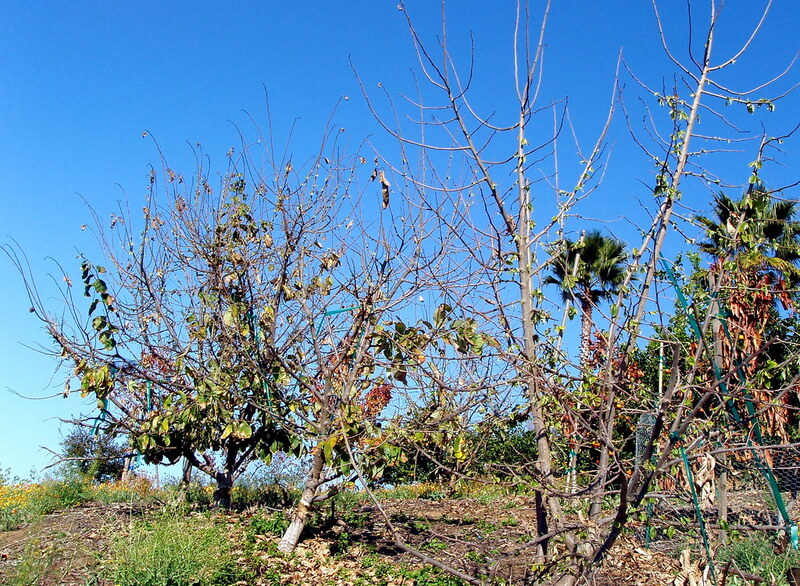 Fortunately, about half the fruit had been harvested before the freeze. The remainder, some still hanging on these almost-bear trees, is now inedible. I am taking a wait-and-see attitude about replanting mangoes, sapodillas, and other subtropicals that we have lost this winter. 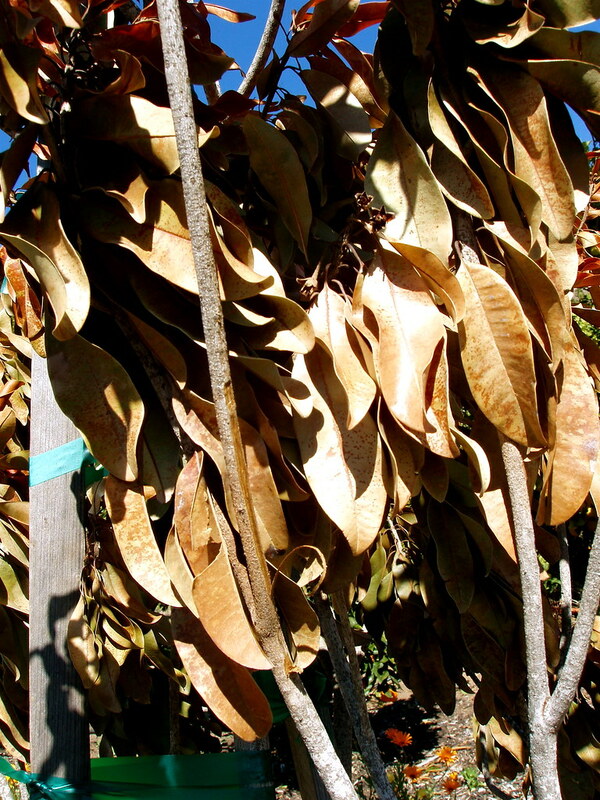 These trees are not cheap, even from 5-gallon pots, and when planted out that young, it takes three or more years before they reach bearing age–which these had finally done. Compare how they looked right after the freeze (when only the pups of the ‘Goldfinger’ appeared to have survived under the tent effect of the parents). 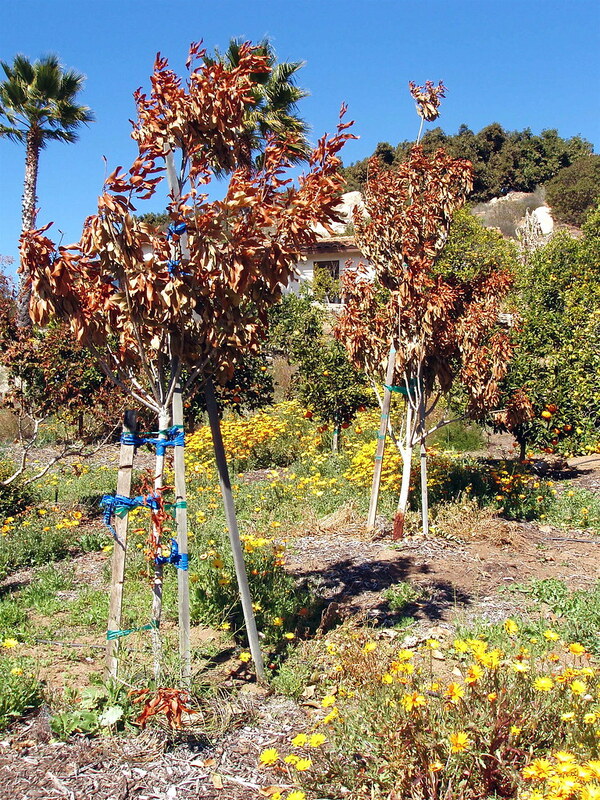 (And then compare pre-freeze, as shown in the first-linked planting).